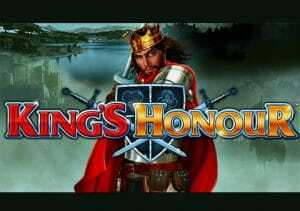 Historical adventure and plenty of it is what’s on offer in King’s Honour, a feature-packed colossal reels video slot from Barcrest. Played using a 5 reel, 100 payline machine, it comes with transferring wilds, symbol nudges that create winning lines and respins as well as a free spins round where 7 possible extras can come into play. Stakes on all devices range from between 10p and £500 per spin. King’s Honour is played using 2 reels sets. The main set offers 5 reels and 4 rows. To the right, the second set is made up of 5 reels and 12 rows. All told, you’ll have 100 possible paylines in play. The design is rather good. The reels are set against a castle backdrop and include playing card suits alongside goblets, Stonehenge, a crown, axes, a warrior woman and the king. The warrior and king spin in full stacks. Land 5 kings in a row and you’ll pocket 50 times your bet. There are plenty of extras on offer in King’s Honour. Transferring Wild Bonus feature – if you land 4 stacked wilds on the main reel set they will transfer to the same position on the colossal reels, then expand to turn the whole of that reel wild. Kings Charge Bonus feature – this can trigger at random on any spin. 1 higher value picture symbol is chosen at random. This symbol is then dropped onto the reels to create a new winning combination. Siege Spins Bonus feature – this respin bonus can trigger in 2 ways. Land 2 free spin scatter symbols on the same spin and you’ll get a respin which offer the chance to land the feature-triggering third. You could also get a respin if you land a stack of transferring wilds. The respin comes with the stacked wilds locked in place. The Excalibur-style sword is the bonus symbol. It appears on reels 1, 3 and 5 on both the main and the colossal reels. Land 3 or more them across both sets on the same spin to trigger the Reel of Honour Bonus feature. Once active, spin the wheel. Depending on where the pointer lands, you’ll win a pot multiplier prize of 50, 150 or 500 times your total bet or some free spins. Wild Arrows feature – between 10 and 40 arrows are fired at the reels, turning the symbols they hit wild. Flaming Wild Arrows feature – again between 10 and 40 arrows are fired, turning symbols wild. You’ll also be awarded 1, 2 or 3 respins with the wilds locked in place. Wild Reels feature – between 1 and 4 reels will turn totally wild. Extra Free Spins feature – between 3 and 25 extra free spins are added to your total. Black Knight Bonus feature – the lower value suit symbols are transformed into higher value symbols. White Knight Bonus feature – all the suit symbols transform into the highest value warrior, king or wild symbols. Colossal Win Multiplier feature – this boosts any wins on the Colossal reels by 2x, 3x, 4x or 5x as well as awarding up to 2 respins. Cash Pot feature – this awards an instant payout equal to 50, 100 or 500 times your bet. Being a Barcrest video slot, you’ll also have to play in Big Bet mode. This set of linked spins will set you back £20 or £30. In return, you’ll receive expanding wilds and/or bonus modifiers in play throughout. If you like plenty of variety from your play, then you’ll be well catered for in King’s Honour which comes with a huge range of extras. At first glance, it all looks a bit overwhelming but it’s actually pretty straightforward. The design is well done and the gameplay ticks along very nicely. If you enjoy the Arthurian legend, then King’s Honour is well worth a closer look. I would much rather play the simpler Black Knight II from WMS which is highly volatile.